You can create an interactive periodic table of the elements to help your students learn about various elements’ properties. 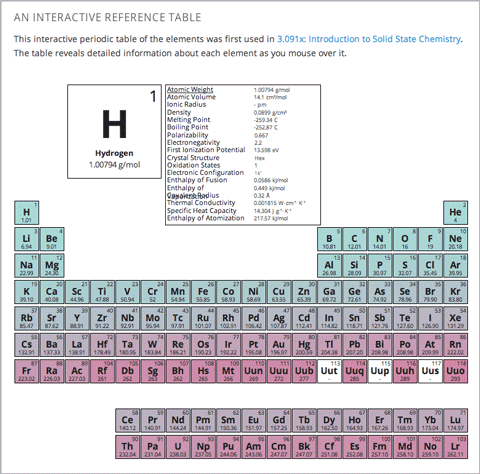 In the table below, detailed information about each element appears as the student moves the mouse over the element. To download all of these files in a .zip archive, go to http://files.edx.org/PeriodicTableFiles.zip. To create the periodic table, you need an HTML component. Upload all of the files listed above except PeriodicTable.txt to the Files & Uploads page in your course. In the component editor, switch to the HTML tab. Open the PeriodicTable.txt file in any text editor.